I’ve spent a lot of time with functional programming languages, particularly Clojure, which I used to create the website we used to manage the aforementioned wedding. I’ve switched this blog from Jekyll to Hakyll (And thus its configuration from Ruby to Haskell). It is about this last point that I intend to write now. I will spare you the usual introduction about what Haskell is, as there are plenty of resources from which you could glean that. I will talk a little bit about why I decided to make the switch though, before walking through a little helper utility which I hope will come in handy. Although I had enjoyed setting up and using Jekyll, I was starting to get a little fed up of it – through no fault of its own, really. In the interests of getting up and running quickly, I used Octopress to get started, downloaded a nice, minimal theme by k-ui (from which my current theme still draws influence), and started tweaking it to fit my needs. The problem was, I had downloaded this big system that did everything for me, and I soon came across problems I didn’t know how to solve. Probably if I’d taken more time with Jekyll I could have figured it out, but I ended up neglecting the site for quite a while to work on the wedding site, and by the time I got back to it I was looking for something new. I considered writing my own, probably in Clojure, but then I came across Hakyll and thought it would give me the excuse I’ve been looking for to give Haskell a try. It offers less “out of the box” than Octopress did (not sure about Jekyll), so I have to set up quite a lot of the basic stuff myself, which means that I come out understanding it much better. Well, that’s the idea, anyway. One of the things I did like about Octopress, though, was that it came with some useful shortcuts. I don’t really want to have to look up the date and write it out every time I write a new post; I’d rather just say “new post”, give it a title, and start writing. As far as I can tell, Hakyll doesn’t provide this functionality – nor should it, necessarily; its job is to compile my site. So I thought this would be an opportunity to have a go at writing a simple utility in Haskell that isn’t just a glorified configuration file. Really this sort of thing would usually be the job of a shell script, so it may be somewhat outside of Haskell’s usual problem domain, but I figured I’d give it a go. This is one feature of Haskell that is pretty interesting: there is language support for writing “literate” Haskell files; that is, files which read like documentation with the occasional code snippet, but those code snippets can be compiled. This way of writing code has become fairly popular recently, with Literate Python and Literate Coffeescript among others, but Haskell supports it natively. The idea has some heritage; Miranda, an earlier functional language from which Haskell draws a lot of ideas, supports it, and the idea was first implemented by Donald Knuth in the form of WEB/CWEB. 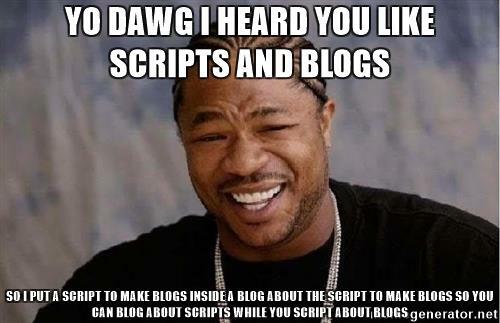 Intrigued by the idea, I decided to write the “new post” script in a literate style, and the result is this blog post! You can copy and paste this page directly (either from the html or the markdown source), and the compiler will ignore the blog post and compile the included code. Lines beginning with “bird markers” (> symbols at the start of lines, like quoted messages in an email) are interpreted by the compiler as part of the source code; anything else is ignored. Having written this blog post as a literate Haskell script, whenever I want to write a new blog post, I literally run this blog post. Haskell’s literate programming system doesn’t allow code to be written out-of-order, so I will go through this step-by-step. Bear in mind that this is my first piece of “proper” Haskell code; it might be really bad! If you are a beginner like me you should probably try to find some more informed sources before you copy any of this stuff. If you know what you’re doing and you spot any silly mistakes / poor style, please let me know, or even submit a pull request on github and show me what’s wrong with it! I am writing this post to learn, not to teach. With that caveat out the way, first I’ll import the necessary modules. We need System.Environment for getArgs, which returns us a list of command-line arguments. The Data.Char and Data.List libraries will come in handy when we want to manipulate strings and lists, as we will need to do to generate titles appropriately. The System.Locale, Data.Time.Format and Data.Time.LocalTime modules are required for dealing with dates and times. Finally I use Text.Printf to generate the command I’m going to run to write the actual post, and System.Cmd and System.Exit to run it. $ new-post "An example blog post"
The way this function works is quite clever. Mathematically speaking, functions can be composed to create new functions which are equivalent to running the second function on the output of the first. Haskell supports this property directly using the . syntax. Here we define normaliseArgs as the composition of words and unwords. Interestingly, doing it this way we don’t have to worry about the inputs and outputs of the function: we simply declaratively state the relationship between the functions. It is generally seen as good form to explicitly state the input and output types for top-level function definitions, however I have chosen not to here, because it feels natural that they should match those of words and unwords. Experienced Haskellers will be able to tell me if I’m in the wrong. >   let filename       = makeFilename normalisedArgs time ".md"
All in all, it’s a very basic script. We read the arguments and the time from the IO monad, generate our header and filename, and then launch our editor of choice with the header text already prepared. That return at the end is a bit of a faux amis. Our main function is defined as returning IO (), but the command we use to launch our editor will return an ExitCode. return simply lets us set the return value for the do block – it does not exit early as one might expect. Let’s start by generating the filename. The filename will be the date, followed by the title (all in lower-case and with hyphens replacing spaces), and finally the file extension. These files all belong in the posts/ directory. filename_base is the string formed by putting “-” between date and title, where date is the date as formatted by formatTime, and title is the arguments joined together and made lower-case. You’ll notice that these variables are declared in pretty much the opposite order to that which you’d use in most languages. In fact, the order doesn’t matter: I could shuffle those lines around and it would still work. In a sense it’s less that you’re “putting a value into a variable” and more that you’re defining what that variable is, in terms of other variables which may or may not have been defined yet. Writing it this way feels strange at first, but it is closer to the way equations are usually expressed in mathematics so in that sense it feels natural. The first paragraph following the code reads like a description of the variables, whereas the imperative equivalent (first call formatTime and put the result in date, then lower-case the title…) reads like a series of instructions. >     headerFormat  = "---\ndate: %s\ntags: \ntitle: %s\n---\n\n"
I’m using printf to do my string formatting largely because I’m familiar with it from C. There are other modules, such as Text.Format, which may be more appropriate, but for now I’m happy using this and it seems to do the job. unwords makes a fresh appearance here to join the arguments back up and form the title. It is perhaps wasteful to do this again after having done it as part of normaliseArgs, but not having to keep hold of various forms of the arguments and the title does keep the code quite simple and easy to read. This is fine, and works, but it has two issues which bother me. Firstly, it generates the file and then opens it – meaning that if I change my mind and decide to quit the editor without saving, the file is left over. Secondly, the cursor begins at the start of the file, rather than where I’d like to start editing. >     vimCmdFormat = "vim '+let @c=\"%s\"' '+put! c' '+normal 3G$' \"%s\""
The haskell is pretty much the same; I’ve just changed the format string I pass to printf, and removed the call to writeFile since I’ll be sending my content directly into vim now. The way I do this is to load the content into one of vim’s registers (+let @c=...), then, having launched vim, pasting the contents of that register back out into the file (+put! c). Finally I position the cursor using normal-mode keybindings, and then pass the filename. As I mentioned, this is my first Haskell program, so I am sure there will be a number of problems with it. If you spot anything particularly bad, please contact me and let me know! You can even suggest modifications to the article by editing it directly here and sending them as a pull request. Any feedback is greatly appreciated! The biggest thing that sticks out to me is my frequent use of printf, particularly when it comes to generating commands to pass to system. This feels a little like overkill, and I’m sure there must be a better way.